Growing up with Scottish parents meant eating a whole lot of fish and chips as a child, at least once a week, usually more. Naturally, it's one of my favorite comfort meals. 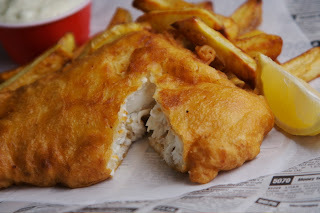 We have a great fish and chips take-out just up the street so I have never made it at home. I knew that was going to have to change when a couple of weeks ago, my boyfriend and I bought our first house and in a few days we will be moving far away from the local take-out. I had to get cracking on my search for a great fish recipe (I already have a tried and true chips recipe.) I didn't have to look any further for the fish than Closet Cooking and Kevin's Beer Battered Fish. Hallelujah, this recipe is fantastic! Dare I say it's even better than our local? I shouldn't, but it is. Now I can move into my new house with the piece of mind that I won't be jonesing for one of my favorite meals. Mix the beer, flour, baking powder, salt and egg into a batter in a bowl. Season the fish with salt and pepper. Dredge the fish in the flour and shake off any excess. Dip the fish into the batter, allow the fish to sit in the batter for about 10 minutes. Remove the fish from the batter and gently place in the hot oil. Fry the fish in preheated 375F oil until golden brown, about 5-7 minutes, flipping half way through. Drain on a rack and serve immediately with fresh lemon wedges and homemade Tartar Sauce . Preheat the oven to 425 degrees. Cover the baking sheet with parchment paper and lightly grease the parchment with vegetable oil. Pat the potatoes dry and slice lengthwise into 1/2-inch thick slices. Turn each slice flat and slice again lengthwise into even fries, 1/2-inch thick. In a medium mixing bowl, whisk the egg white until very light and foamy. Add the potatoes and the creole seasoning to the egg whites and toss to coat evenly. Spread the coated potatoes on the prepared baking sheet, not touching. Bake for 30 minutes, or until golden brown and crispy; halfway through the cooking time, with a spatula, scrape the potatoes from the baking sheet and turn. Carefully remove with a spatula to a large serving plate, or individual plates. Serve immediately. Your fish and chips look really good! I like the sound of the creole seasoned chips. May i know how long it can stay crisp? Mmm! That looks way better than anything I've ever gotten in a restaurant. And the chips sound amazing! The fish and fries with the lemon look great. I wish I had some right now!! Wow this looks so good. Maybe I'll have to surprise my boyfriend with this for dinner one time. He loves fish and chips. I love a good batch of fish & chips. Thanks for pointing me toward this recipe. That fish looks perfectly fried but not greasy at all! Delicious! Thanks for the great recipe Kevin! Hi Family First, It's best to serve the fish as soon as possible. It will begin to soften as it cools. However, if this happens (as it did while being photographed) you can add it back to the hot oil for a minute on each side. Oh Hallie Fae, he will love you for it! It's not greasy at all Sophie. I was so pleasantly surprised. And the chips are oven baked so you don't have to feel guilty!